So in case nobody knew, I was at the Distant Worlds: Music from Final Fantasy orchestra in KLCC yesterday. Read about my madness here. And also as I mentioned in that post, my overly enthusiastic brother decided to get to the mall just about 2 and a half hours earlier than our concert resulting in us running off for lunch...in the KLCC food court. I'm not talking about Signatures over in Level 2, I'm talking about the other one on the highest floor and right at the end. What is it with big malls and having two different food courts?! Sheesh...lansi. To be very honest, I'm not exactly the biggest fan of food courts because they are either expensive or they don't taste good. Or both expensive and tastes like crap. Although my brother; the personal chef of the Lam residence; told us that the soup noodle from one of the stalls tasted good, I just wanted something else. I'm trying hard to be rebellious! And that was when I spotted...Pepper Lunch Express! I've seen people having Pepper Lunch over in 1U's Food Junction but I've never gotten to try it because every time I am there, I would either succumb to the Thai food or the Japanese section. Such a sucker. 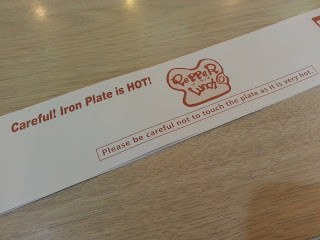 Of course, then I remembered about how Xiaxue mentioned something about Pepper Lunch a while back in her blog...and so I thought it wouldn't hurt to give it a try. I mean, if there's so many people raving about it and the all-round famous Singaporean blogger was giving it such great reviews, there should be a certain standard to it, right? Right. Sadly enough, I couldn't convince my mum to get whatever I've gotten otherwise I could have tasted more food from Pepper Lunch Express. *Sighs loudly* But anyway, here's what I managed to grab. Careful! Iron Plate is HOT! What I got is called the Teriyaki Chicken and it comes originally with rice, chicken slices with teriyaki sauce and a handful of sweet (and I totally mean sweet as in VERY sweet!) corn kernels. However, I noticed how they had a dish that served CHEESE together with it but unfortunately it was beef and I didn't quite like the taste of beef. So I opted for an add on of cheese for an extra RM 2 to my Teriyaki Chicken that costed RM 9.90. Preparation in the kitchen took less than 5 minutes and I was served with something that looked just as good as what you see up there. For RM 2, I take it that the cheese was a good grab and the plate simply sizzled away as I waddled off to my seat with my brother, his girlfriend and my mum. Before mixing everything up, the first thing I did *coughs* was to Instagram my food. I'm such a guilty Asian for all these sucker things. Eventually after my followers got to see what I was going to devour, I did what the strip of paper surrounding my iron plate told me to do. Shockingly, there was butter hiding in my rice! I had no idea! It felt like a good concept, letting your customers cook their own food. It was something like the Korean's bibimbap (mixed vegetables and rice) in a stone pot that I could get from the restaurant in Amcorp Mall and I really liked that idea. Not only did I know for sure that my food was hot, I could make my own food. I'm a chef...or at least for a moment I am. Now, notice how the cheese was spread out generously on top of the rice and sweet corn and layered with the sizzling chicken slices at the side because THIS was the outcome of my "cooking". 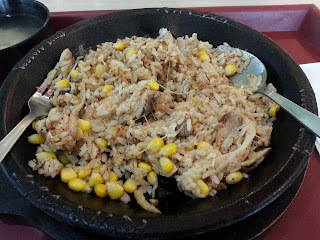 Check out that gooey goodness sticking around my rice, chicken and sweet corn! I could have DIED the moment I took the cheese off my piling rice because all the gooey goodness of the cheese began to spread out to the entire iron plate and the smell was amazing. Additionally, I poured in the Honey Sauce that they offered for a sweeter taste and I loved it! I loved how the cheese stuck to my teeth while the juices of the sweet corn burst out on my teeth. I loved how tender the chicken was...and I even ate the skin that stuck to the chicken. Now THAT is word, because I would never eat chicken skin unless it was friend like the ones in KFC. Also, I've never been a big fan of black pepper but whatever was on this iron plate of heaven definitely was to my liking because it was not too spicy and gave just the right aroma to the rice. Needless to say...I finished it all. I'm such a pig. It was really good and I had to bite my cheek just so I wouldn't lament that there was no more to eat. I'm such a pig. 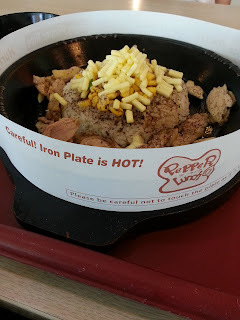 Although this was my very first time having Pepper Lunch Express, I could swear that I've fallen in love with it. As for the bill, I take it that RM 16.20 (with taxes included) was a little on the pricey side but the great taste made up for whatever I've forked out. I didn't get any drinks from them though because my mum decided to just get a bottle of mineral water and share. 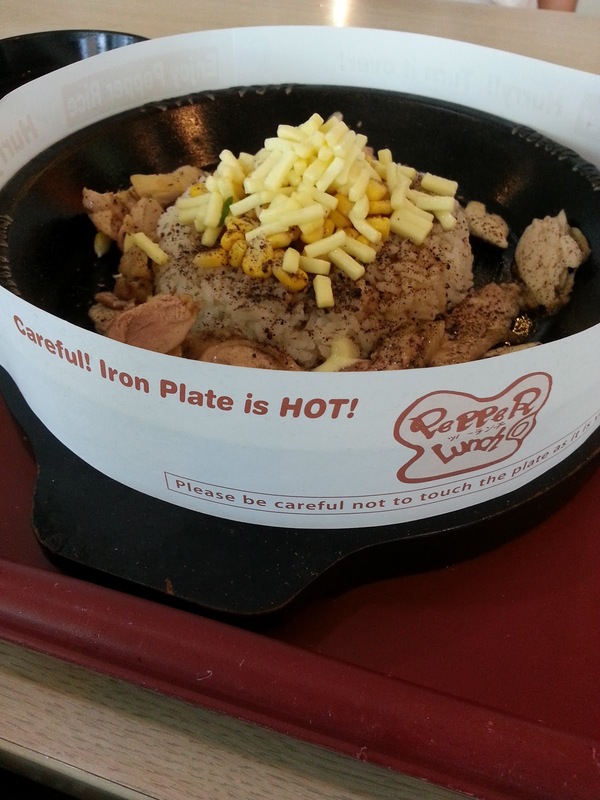 My overall call for my first ever experience with Pepper Lunch express would be an 8/10 for taste and a 6/10 for price. Maybe the tax really piled the price a little high...because otherwise it would have just been RM 11.90 and that would have been awesome. 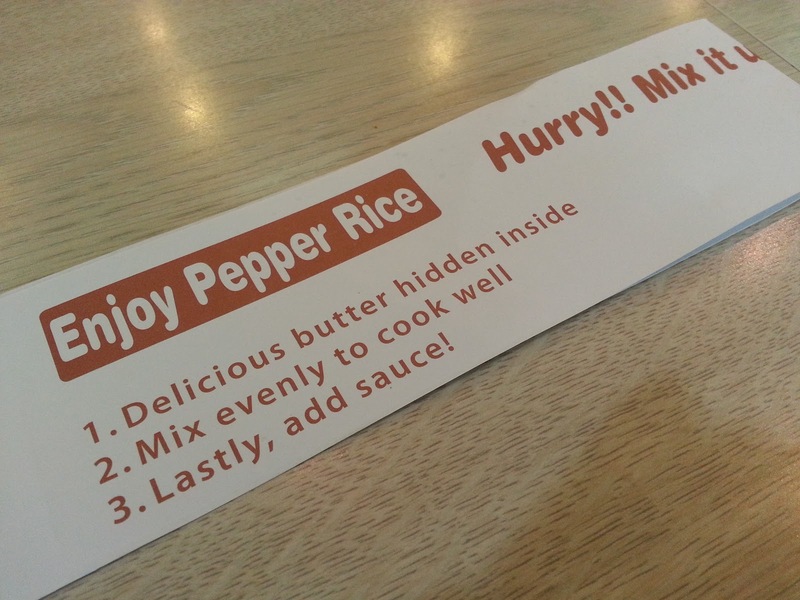 Whatever it is, I'm hoping for another go to Pepper Lunch Express in 1U's Food Junction so that I could try OTHER foods on their menu because it does look like they have quite an extensive menu. There's additional Shitake Mushrooms and other condiments ranging from RM 2 per side so you're most welcome to take your pick and try it out for your own taste. 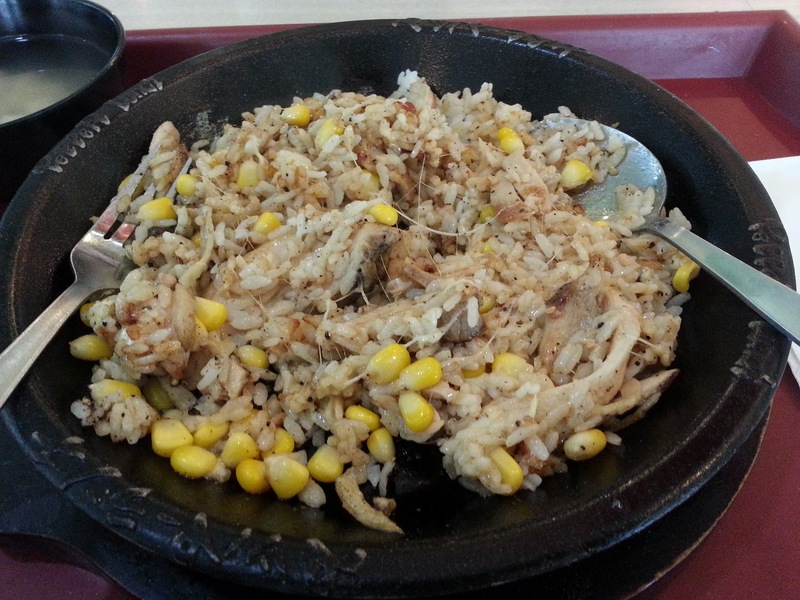 Pepper Lunch Express. My new food court favorite.